High Tea Society has clicked over 10,000 Instagram followers and to celebrate we want you to enjoy High Tea in style and give you the chance to win an Emerald Island tea set from Cristina Re. 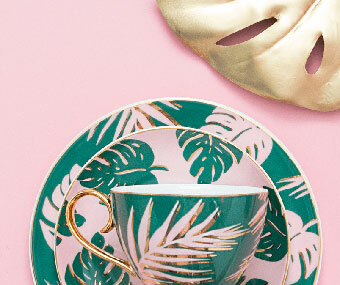 The tea set includes: 2 teacups and saucers, 2 side plates a 2 cup teapot and a tea strainer from Cristina Re’s Emerald Island design. The prize is valued at $200RRP. Experience High Tea in style with this luxury Teacup and Saucer by Cristina Re. Escape to a dreamy tropical resort with the new ‘Paradise Palms’ Collection, inspired by luscious green fauna, magical pink sunsets and deep blue oceans. Made from the finest quality New Bone China and embellished by hand with a lustrous 24ct gold finish. 1. Follow @highteasociety & @cristinaredesign on Instagram. 2. Tag at least one friend on any of the competition posts on Instagram. Note: it’s okay to have more than one friend. 3. Like one of the competition posts on Instagram. – Prizes will be delivered free of charge to any valid Australian address. – Competition closes 12th of August 2018, 5pm. – Winner will be drawn randomly and will need to have followed the entry instructions. The winner will be announced on Instagram by the 15th of August. Congratulations to the winner Laurinda Kelly.